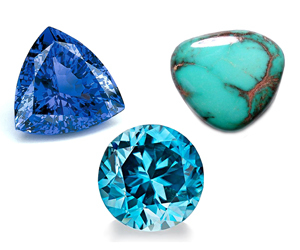 The only month to lay claim to three birthstones, December is represented by blue zircon, turquoise, and tanzanite. In the Middle Ages, zircon was used to induce sound sleep, drive away evil spirits, and promote riches, honor, and wisdom. Zircon occurs in many colors, including red, pink, brown, yellow, hazel, black, but it can also be colorless. It is primarily mined in Cambodia, Thailand, and Australia. Turquoise has been used in jewelry and decoration since antiquity. In Iranian architecture, the blue turquoise was used to cover the domes of the Iranian palaces because its intense blue color was also a symbol of heaven on earth. Mined all over world, the highest quality turquoise is found in the American Southwest and the Middle East. Tanzanite was first discovered in 1967 in Tanzania, East Africa and is known for its unique blue-ish purple hues. It is only found in Africa and is sometimes treated to draw out the deep purples it exhibits. It was only in October of 2002 that tanzanite was added to the official birthstone list by the American Gem Trade Association.